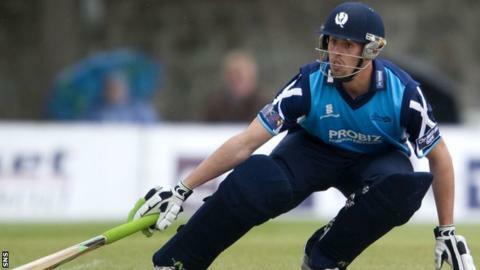 Scotland open their World Twenty20 qualifying campaign against Bermuda on Friday, the first of seven group games in the United Arab Emirates. Six out of 16 teams in the tournament will progress to next year's finals in Bangladesh. Scotland warmed up by defeating the United States by seven wickets in Dubai on Tuesday and Namibia were beaten by nine wickets in Abu Dhabi on Wednesday. Opener Calum MacLeod made 46 and 62 not out, respectively, in those wins. Having been at a conditioning camp in Sri Lanka prior to their arrival in UAE, the Scots surpassed the Americans' total of 133 for seven with seven balls to spare. Namibia's total of 116 for six was then bettered after 12.2 overs. "We feel we have all bases covered in terms of flexibility in the squad like right-hand/left-hand combination in batting, different aggressiveness styles as well," captain Kyle Coetzer told the Cricket Scotland website. "In bowling, we have right-arm and left-arm bowlers, which we have not had in the previous couple of tournaments. So it is nice to have that option, we have three left arm bowlers in our ranks, which give us variation. "It will be massive for cricket in Scotland and for all the supporters we get from throughout the country. "We have not been involved in a world tournament for a couple of years now, so it will be nice to get back in the world stage now." Paul Collingwood, captain of England's 2010 World Twenty20 winning side, has joined Scotland as a temporary assistant coach for the event and will stay on for the 2015 Cricket World Cup qualifier in New Zealand in January. "Obviously, the experience that he brings being the England T20-winning captain is valuable," added Northamptonshire batsman Coetzer. "In terms of batting, he is really helping guys understand how to get about scoring their runs, or chasing down totals and setting a certain total. "Having someone like Colly will be a massive advantage to our boys."